The complete liberation of Eastern Ghouta is imminent. Just as during the liberation of Aleppo, western governments and mainstream media inflated the numbers of trapped civilians and accused Syrian government forces of deliberately targeting them, failing to provide them with humanitarian aid, preventing their evacuation, and indiscriminately bombing them in Eastern Ghouta. And, just as in Aleppo, they were proven wrong on all counts. In Eastern Ghouta, the Syrian government provided thousands of tons of humanitarian aid to the terrorist-held enclave, from which western-backed militias shelled the city of Damascus for a period of five years, killing over 10,000 civilians, including 1,500 children, and injuring over 30,000 others. 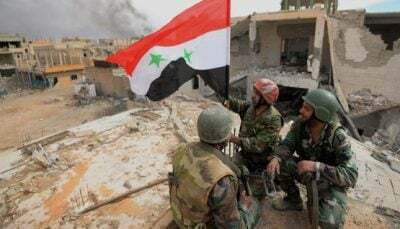 During the liberation of Eastern Ghouta, the Russian air force and Syrian Arab Army declared several ceasefires during which tens of thousands of civilians were able to escape their terrorist captors and flee along humanitarian corridors created by the SAA on the ground. Many live videos of the torrent of escaping civilians include first-hand reports from them that they were held captive by western-backed mercenaries who bullied and killed their family members, hoarded the food aid, stole their property, and fired upon them when they tried to escape. In the videos, the joyous citizens repeatedly express their gratitude to the SAA and to the government of Bashar al-Assad for their rescue. Unfortunately, as in Aleppo, no western media outlets chose to record these post-liberation events, which don’t fit into their false western narrative about Syria. 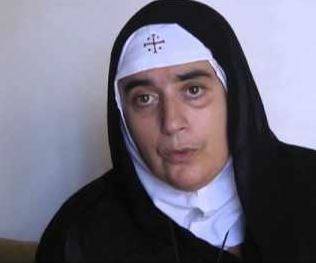 In addition, it should be noted that Mother Agnes-Mariam (right), a Catholic mother superior involved in the Syrian Reconciliation Movement and an official involved in the relief effort for the rescued Eastern Ghouta civilians, reported that a full 25% of the women and girls rescued from terrorist-held areas report that they were sexually abused by their captors. Just as in Aleppo, the Syrian government provided bus transportation for thousands of surrendering terrorists in Eastern Ghouta to leave the enclave with their families and small arms for the province of Idlib, thus preventing needless deaths and destruction, and opening the door to reconciliation with the small number of Syrian fighters among the terrorist militias. The liberation of Aleppo and Eastern Ghouta compares favourably with the destruction wrought upon Mosul and Raqqa by the US Coalition in re-taking those two cities from ISIS. In Mosul, 30,000 civilians died as a result of unrelenting US Coalition aerial bombardment and artillery barrages. In Raqqa, 3000 civilians so perished. Raqqa, in fact, has been turned into a ghost town, its buildings flattened and its water supply having been also destroyed in the bombing. Following the destruction of Raqqa, its ISIS defenders were also transported out, but not to Idlib. 4000 were taken in a convoy to northeastern Syria and incorporated into the military force that the USA is trying to create there, following the defeat of ISIS, under the cover of a political Kurdish entity, in violation of international law and its own constitution. In contrast to Mosul and Raqqa, hundreds of thousands of Syrian refugees returned to their homes in Aleppo in the year following its liberation, precisely because the Syrian government chose not to carpet bomb the city but rather to liberate its occupied eastern sector house by house, street by street, and neighbourhood by neighbourhood. Many Syrian soldiers lost their lives in the process but civilian casualties and destruction was kept to a minimum in Aleppo. The war crimes committed by the US Coalition in Mosul and Raqqa received praise from other western governments and mainstream media, whereas the very professional liberation of Aleppo and Eastern Ghouta received only hysterical condemnation – and calls from Amnesty International, as well as the Aleppo and East Ghouta “Media Centres”, propaganda arms of Al Qaeda’s White Helmet operation, to “do something.” They were calling, in effect, for direct western military intervention. During the course of the liberation of Eastern Ghouta, the US government moved three naval attack groups close to the shores of Syria, one in the Mediterranean Sea, another in the Red Sea, and a third in the Persian Gulf. At the United Nations, US Ambassador Nikki Haley issued repeated threats of an imminent US military strike directly upon the Syrian army and government (as opposed to the US use of proxy armies of terrorists since 2011 in a failed attempt for regime change in Syria). Her threat violated Article 2 of the UN Charter which forbids even the threat of the use of force against a member state. The trigger for this threatened direct US attack on Syria, she warned, was any use of chemical weapons by the Syrian army. It should be noted that, after the chemical weapons incident in Eastern Ghouta in 2013, which was later shown to have been carried out by the terrorists, the Syrian government surrendered its entire stock of chemical weapons and joined the international convention against chemical weapons. Fortunately, the Syrian Arab Army advance on Eastern Ghouta was so fast that the terrorists had to abandon their Eastern Ghouta chemical weapons lab in their flight, before being able to manufacture the required pretext for Haley. The lab fell into the hands of the SAA which exposed its existence to the world. The Russian government has made it clear, on two separate occasions, that it wouldn’t tolerate any direct attack by the USA on Syria which would endanger its own personnel in the country. Unlike the USA, Russia’s military presence in Syria is in accordance with international law because it was at the invitation of the sovereign government of Syria. Russia made it abundantly clear that any direct US attack on Syria would be met by the destruction of the platform from which the attack was made. At the time of publication, Eastern Ghouta was almost entirely liberated. However, several pockets of terrorist-controlled areas continue to fester in various regions of Syria. More ominous, however, are the sizeable chunks of Syrian territory that have been seized recently by foreign powers in what appears to be an illegal attempt to partition the country and to drag out the war. In the south, Israel continues to occupy the Golan Heights and spreads its influence through the ranks of the so-called “Free” Syrian Army to areas east of the Golan. In the north, Turkish forces have seized Afrin and are advancing towards Manbij. East of the Euphrates, the USA is consolidating its hold over Syria’s oil and gas industry (which it is looting), its water supply, and some of its best farmland. The USA is augmenting its own forces with “contractors”, recycled terrorists, and thousands of Kurdish irregulars. None of these foreign military occupations have the least pretext under international law. The Syria Solidarity Movement looks forward to the day that Syria will regain its full territorial integrity. However, the road ahead is fraught with danger, mainly the threat of a wider regional war, and even a world war involving all the great powers. We call upon the people of all the countries, parties to the US aggression against Syria, to look past the lies and distortions of their governments and media and demand that their governments withdraw from participating in the illegal attack upon the sovereign country of Syria. Instead, they should urge their politicians to end all economic sanctions against Syria, restore diplomatic relations with the government in Damascus, and make plans to aid in the reconstruction of the country.